One of the most expected novelties of this year has appeared, at last, and in Moscow practically simultaneously with the beginning of global sales. While the phone is not officially certificated in our country, but this is the business of time. Depending on representations of sellers about the rate of return, it is possible to buy it for the sum from 500 up to 650 USD, in some regions of it is selling for 850-1000 USD. The average European price in retail networks changes about 500 USD, but affects the lack of devices: Ericsson Company was not expecting such demand, has not prepared enough of phones. 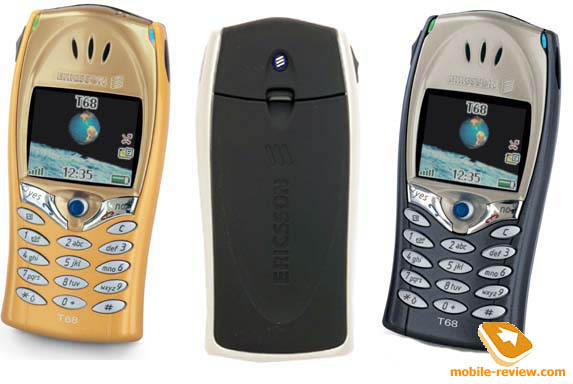 In general, in Europe two novelties are the most popular, in particular: Nokia 8310 and Ericsson T68 - both concern to class of fashion devices. We shall try to understand, that involves buyers in Ericsson T68. It is small phone in sizes (100х48х20 mm), the weight is also small - only 84 grammes. Two colors of the case are available: golden (Ziroccan Gold) and grey (Lunar Grey). The phone is less attractive in photos, than in life: colors and appearance of the case imperceptibly differ from the image. Absence of the external aerial makes device's look more interesting, and silvery lateral surfaces favorably contrast with the forward panel of phone and the back cover, which simultaneously is also the battery. The back surface is executed from black matte plastic which is to touch similar to rubber - rather pleasant sensation, plus the phone does not slide on inclined surfaces. The lithium-polymer battery, capacity 700 MAh; under the statement of the manufacturer, is capable to work till 11 hours in talk mode and till 300 hours in standby mode. 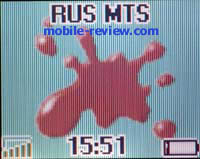 In conditions of Moscow networks phone worked about 5 day at 15 minutes of talkings in day and minimal use of other functions. On users' opinions, at one hour of conversations per day the device suffices for 2 days of work. At active use phone's functions, games, alarm clock and average time of talkings of 30 minutes it is capable to work about 3 days. It was possible to expect considerably a smaller operating time of phone, as presence of the color display sharply reduces the general operating time. To honor of engineers of Ericsson Company it has not taken place, by the way, and other model, in particular Т39, works from one charge for very long time. Average time of the full battery's charge is hardly less than 2 hours. 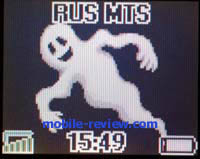 On the display it is necessary to stop more in detail as on this parameter the phone differs from any GSM-device which has been submitted in the market up to that. 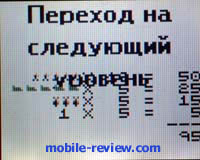 In Т68 the graphic display is installed, allowing to display up to 256 colors and having resolution of 101х80 pixels at the physical size of 34х28 mm. On the screen it can be displayed till 8 lines of text, that is not bad and allows looking through short messages or wap-pages without difficulty. In the standby mode with the switched off backlighting the display is blind, it is necessary to peer, it is impossible to make out the screen without backlighting... With the switched on backlighting you see the screen rather good, the text is precise, images are clear. There is an opportunity to leave backlighting constantly switched on, and then the phone will suffice per day of work, for the night it is necessary to charge it. 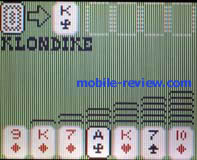 Besides all, you can adjust contrast of the display (10 divisions). There is an opportunity to setup three types of fonts: standard, big or small - I have more as desirable standard. And, at last, last decision concerned with cecutiency of the display in standby mode is a clock. In standby mode on the black background moves light digital clock, due to contrast they are rather good visible and rather pleasant on kind. On direct solar light the image on the display is visible, but, naturally, not so good, nevertheless the work with phone does not present just a few problems. Backlighting of the screen is fulfilled with the help of the LEDs located sideways. Finishing the story about appearance of Т68, it is necessary to tell about the keyboard - it's fulfilled from plastic and has silvery covering. Inscriptions on keys are visible in any conditions: both on bright light, and in darkness. Under the screen there is a navigating key which, despite of the small size, is extremely convenient - besides 4 directions of displacement, it can be pressed. All is very simple and convenient. At similar set of functions as Т39 has, this device is essentially another, in part it is concerned with that the print on functionality has imposed the color display, and in part that Ericsson company has reduced the old development to mind. We shall start with the most simple, in particular from the menu. To get in, it is possible, having pressed on navigating joystick or having moved it in a horizontal direction. You will see at once 9 pictograms of the main menu, now there are no bookmarks as earlier, and the new type of the menu became much more convenient. So, now it is not necessary to look through all bookmarks consistently, it is possible to choose the necessary item, moving in any direction. Fast navigation in menu with the help of shortcut numbers was kept. Inside the menu remained the same: the usual list from items, each of which is numbered. There is an opportunity to appoint fast keys for separate items of the menu, all up to 14 items. Let's consider the items under the order: first, it's, certainly, a phonebook. It's possible to keep about 510 numbers in it (memory of phone), plus up to 230 numbers in SIM card memory. For each name it is possible to record about 5 numbers (home, office, mobile, fax, another), and also to specify e-mail address, name, surname, company and the name (it refers to so, here you can writhe whatever you want). For text fields the maximal number of symbols is equally to 15, and for English and Russian languages there is no difference. Unfortunately, despite of such function presence as predicative input of text Т9, to activate it was not possible. To phonebook entries can be assigned various groups of subscribers which you are free to create at the desire. There is an opportunity to appoint up to 41 voice tags for dialing of numbers from phone book. In addition to this there are voice identifiers such as number, i.e. it is possible to say name and then type of number, for example, "Home", and the phone will choose home phone number for this subscriber - conveniently. Recognition works rather well, but traditional there is a small problem - an opportunity to create two identical labels, a check in phone is not present. So, having created tag "Andrew" (for example, his surname is Samoilov), you can call on its number, but having created subsequently the same tag for Andrew Black, you automatically replace the first. More precisely, there will be both tags, but the dial will go only on the second. Other manufacturers, for example Motorola or Alcatel, on new models has check of tags existence. Besides voice tags for dial of numbers there is an opportunity to add tags for call of profiles is too rather conveniently. It is a pity, that while calling a voice dial the delay before a dial makes about one and a half - two seconds - it is necessary to wait. There are also two voice commands for management of dictophone: "record" and "listen" - they work, certainly, only in standby mode. 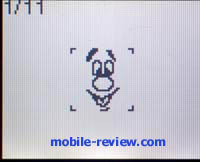 By the way, the dictophone in the device allows saving till 108 seconds or till 41 seconds with high quality. Restrictions by amount of records within the limits of general time are not present, there is an opportunity to appoint each record the name, to edit them separately. And now unpleasant news: in phone there is a menu in which it is possible to choose what will record dictophone - your voice or a voice of the interlocutor, simultaneous record is not present. To begin record it is necessary to enter menu, it is also inconvenient - in the fast menu there is no "Dictophone" item. 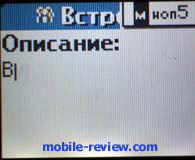 “Magic Word” function which is present in Т39 and R520m, is also in this phone, but works only with connected headset or with the automobile handsfree set. In standby mode it does not work. For those who has forgotten, I will remind, that this function allows to activate voice commands remotely, it is enough to say the key word and then say a voice tag. Traditionally it is necessary to consider "Message" item - here all is standard, as well as in other modern devices from Ericsson. There is a section of e-mail sending: phone supports РОР3 and SMTP-server, all is extremely simple and clear. At work with e-mail the built - in client downloads headings of messages, thus cyrillics is read not always correctly. Also there is a problem: not all addresses of post servers are perceived by "BeeLine" network, it was not possible to adjust reception of mail for some addresses. By the way, addresses of servers can be specified both in an obvious kind, and as ip-address. There is an opportunity to create the templates for short messages. Phone supports completely EMS standard, there is a support of MMS, distinguished by an opportunity of sending audio and video files. In the present version of the software this function is not realized, as demands support on the part of operators, but in the instruction is told, that in new software versions it will available. In phone is standardly installed a set of small pictures which can be sent with the help of short messages to other devices. It is more interesting, that phone allows changing menu appearance, it concerns background and headings, and there are 5 appearance themes - very pleasant innovation really diversifying the device. Besides it is possible to install one of 10 color pictures as wallpaper - you will see in standby mode. Also it is possible to load with the help of wap-browser one of 12 pictures from the site of manufacturer, for this purpose it is enough to type the address - - http://www.sonyericssonmobile.com/T68/resources/background.htm. Only one picture is kept in memory. Besides it is possible to prepare the picture independently, thus it is necessary to remember, that it should be in GIF (Graphical Interchange Format, 87a or 89a without animation) format and the size no more than 8 KB (3 KB when using wap-loading). Let's stop on other functions: there are two alarm clocks in the phone - usual and special. As well as follows from the name, the usual alarm clock is rather simple, it works once, and for special it is possible to adjust days of week when it will work. 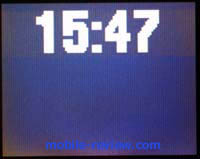 There is a countdown timer, with its installation and start the line of time in standby mode is replaced with the timer. At operation of the timer you will hear a sound signal and feel vibration. The stop watch in phone allows to receive intermediate values and to receive intermediate value, to keep the received results as in other models, it is impossible. 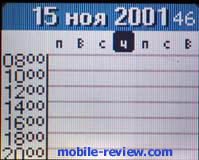 It necessary to add, that in phone there is a calculator and an instruction of codes, all is very simple and clear. At last, the most interesting item is a calendar or simply an organizer. About 300 marks and up to 80 tasks are possible to create here, that depends exclusively on length of the accompanying text as the memory is allocated dynamically. There is an opportunity of data synchronization with a calendar from PC, thus the data on phone can be seen both for day, and for week. At viewing calendar for month all numbers for which there are tasks, are allocated with a fat font - at constant use of organizer it is inconveniently. In total it is possible to enter some types of events: trip, memorial, meeting, vacation, call, anniversary, miscellaneous. Also there is an additional list for tasks, here it is possible to enter the information on necessity to make a call, to send a message or to make something else. So, at operation of reminder on sending of sms you at once will get in the menu of type of the message that is rather convenient. 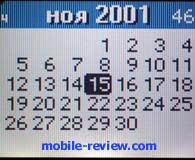 On operation of calendar events calendar phone will notify with vibro-and sound signal, thus it will suggest you to choose the current profile, sometimes it's conveniently, sometimes not. 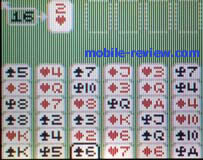 In phone there are 6 games, all of them are color - already known Erix, Ripple, Tetris and new Game (space shooter), Q , Solitaire (4 patiences). In "Game" resulting values are deduced not so beautifully - small kickshaw, but it is unpleasant. Т68 on sound quality is quite good, moreover, on sensitivity this device surpasses all models of Ericsson company behind exception Т39. 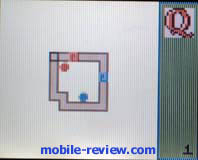 And it means, that Ericsson Company was possible to release rather quite good device which can be named one of the best in model line of Ericsson phones. Frank problems with sensitivity are not present, phone began to hold confidently connection there where other devices of this manufacturer lose network. Besides at loss of network repeated registration occurs rather quickly. If the phone is in a zone of weak signal losses of voice are possible, thus the communication is not torn, and during any moment it can improve - undoubtedly, it is a plus. From errors of R1B firmware only one has been noticed: at input of new event in calendar and incoming call there is a window of call with a question, whether you want to accept, but, unfortunately, not always it is possible to answer this question as the key "Yes" does not work. This problem was shown not always and approximately in 10 percent of cases at editing calendar. The keyboard of phone, despite of the small size, is convenient, in general the device lies well in hand. 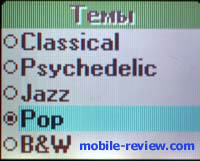 Unfortunately, on tones and the melodies installed in memory, phone is rather poor, there are only 10. To tell the truth, there is an opportunity to receive or create up to 8 melodies. 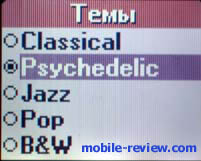 At a choice of a melody it will be played up to the end in any case even if you have already left this menu. On loudness of ring the phone is average, but a call, nevertheless, it is audible. Vibration alert is felt well, but all the same I do not recommend carrying phone in outer clothing. By communication opportunities this device is rather quite good: there is a wap-browser which is rather simple in adjustment and normally works, and also IR-port. From newer technologies it is necessary to note the batch data transmission (GPRS) and Bluetooth. And on this device GPRS works rather stably: for a night I managed to receive about 40 Mb of the data without special problems. Adjustment of GPRS for the personal computer is similar to adjustment for other Ericsson devices. The complete set of delivery does not include CD with the software, and it is a pity - it could be useful to beginning users. For Т68 the manufacturer results SAR size and as by ICNIRP version where calculation goes for 2W/kg above approximately 10 grammes of tissue, and in this case SAR it is equal to 0.49 W/kg (10g), and under version IEEE where calculation goes for 1.6 W/kg above approximately 1 gramme of tissue, and SAR in this case is equal to 0.74 W/kg (1g). Technologically phones from Ericsson always were on the ball, but lost to devices of other manufacturers on communication quality. Now, similar, all things change, and Т68 is superfluous acknowledgement of this. Occurrence of the third range, namely GSM1900, sharply expands number of potential Т68 users . A little differently are realized some functions, now dictophone became inconvenient in use, but other pluses cross out these small lacks. The device is rather balanced and works without problems which could be expected in such complex product. Certainly, the current price of phone is not completely optimum, but it is difficult to expect, that in the near future it will considerably decrease. In my opinion, the price on Т68 will not be lowered below 400 USD the nearest half-year. And it means, that phone will use the big popularity as the market feels necessity in expensive image devices which recently was not presented.